Every weekend, I cook the McCallie family breakfast: bacon, diced hash browns, pancakes, and scrambled eggs filled with ham and green onions. Although it would be easy for me to assume that everyone can scramble eggs, that may not be the case. I thought that I would start posting some techniques that I use to cook basic food. 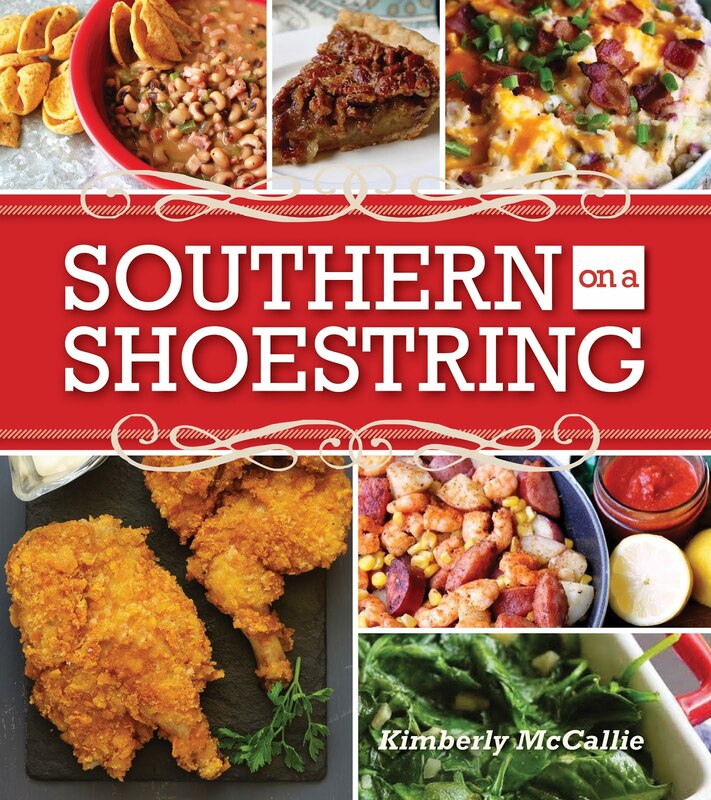 I'm hoping that as I continue to learn and grow as a cook that I might share some little tidbit that will make you say, "Hmmm...I never thought about that before." As a student of culinary lit, it's those "hmmm" moments that I live for. 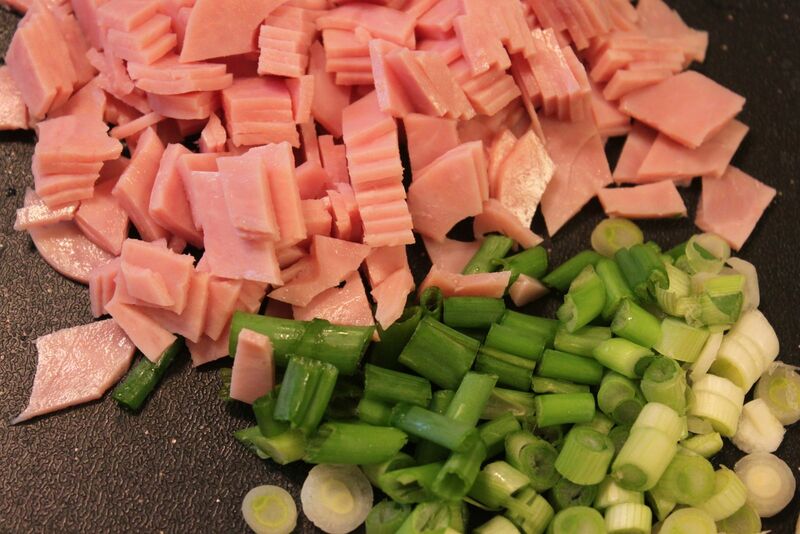 I start off with ham and green onions. This is a small pack of ham that has four slices in it. 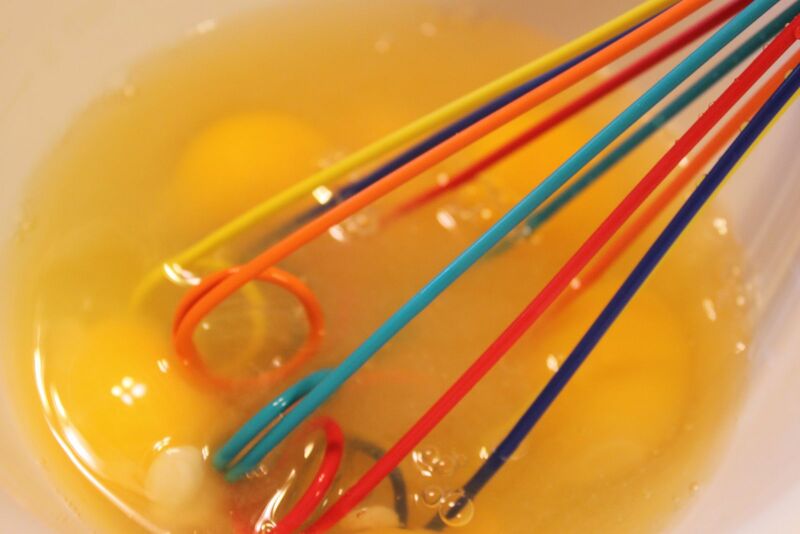 It's perfect for a batch of five or six eggs. Plus, as you can see, it's only 99 cents! You can use ham or turkey. 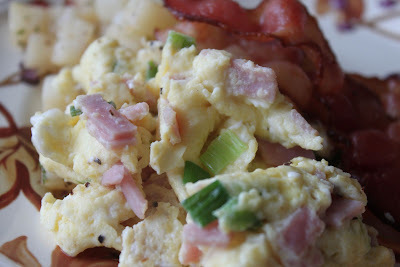 And, of course, you can use leftover baked ham. You could also add some diced bell pepper, too. 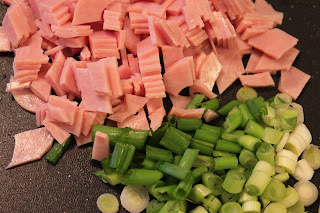 Dice the ham and onions. 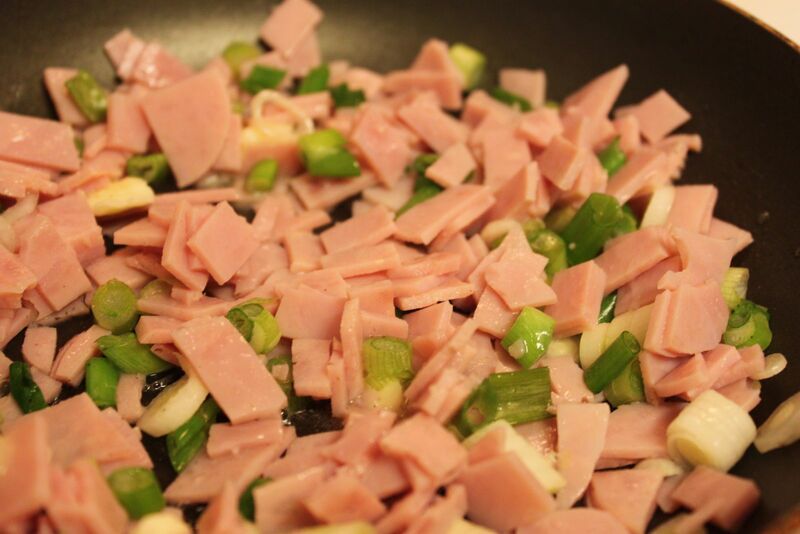 In a small skillet, I cook the ham and onions with a small pat of butter. 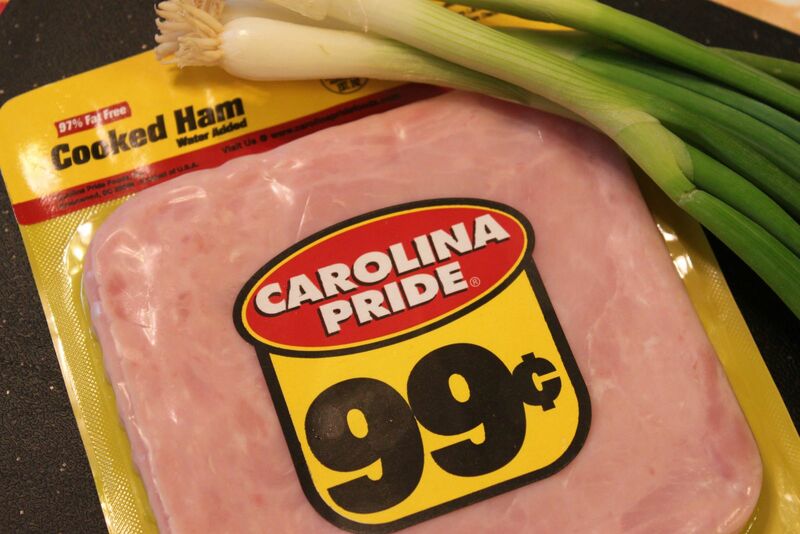 I just like to soften the onions and get the ham warmed through. 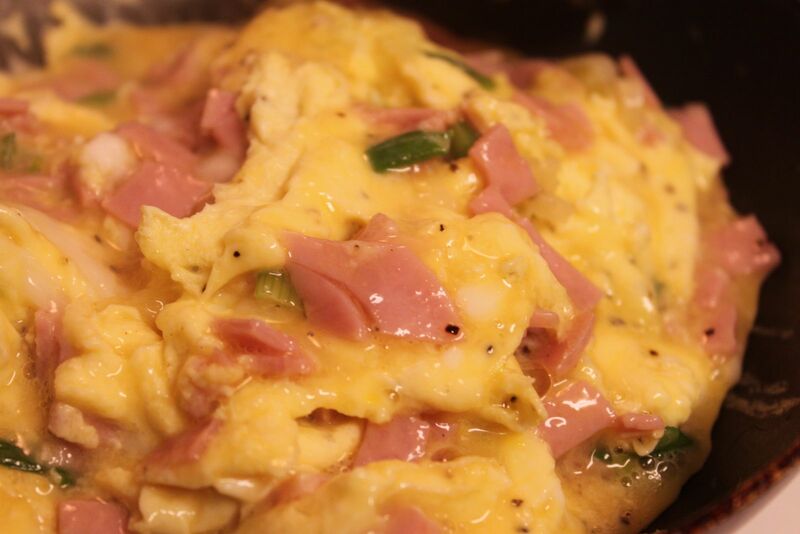 Leave them in the skillet as you prepare your eggs. This is five eggs. I added about a tablespoon of cold water before I beat them. Learned that trick on the Food Network. It makes for fluffy eggs. You could also use a splash of heavy cream or milk instead of water. Even though I cook my eggs in a non-stick skillet, I like to spray the perimeter of the skillet with cooking spray. I gather the ham and onions into the center of the skillet and spray the sides of the skillet with cooking spray. 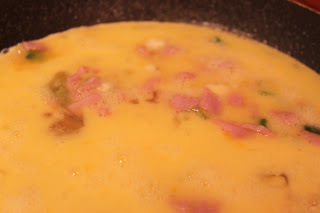 Pour all of the eggs into the skillet at once. I season with pepper at this point, but I like to wait until the eggs are almost done before I add the salt. Adding the salt too quickly can make the eggs tough and chewy. As the eggs start to cook and set around the edges, use a spatula to pull the eggs away from the edges of the skillet and fold them over into the middle of the pan. Continue the process until they're at the consistency that you prefer. Some people like their eggs moist, others like dry eggs - it's up to you. Add a sprinkling of salt, if desired, at this point. And, if you're a cheese lover, throw some of that in now, too. 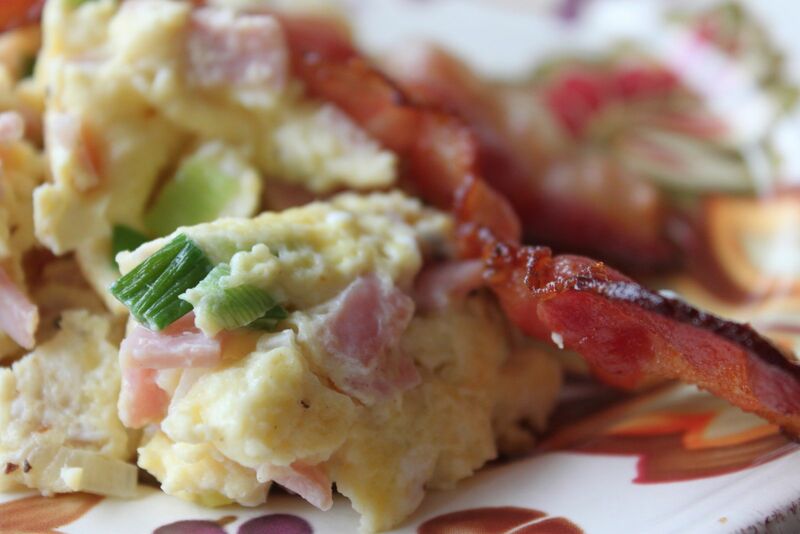 These eggs can stand alone as a complete breakfast or light dinner. I hope you'll try them and enjoy! This was awesome as a use-up-the-leftovers meal. Dice up some leftover turkey from Easter, toss in some leftover frozen onions/peppers, a couple slices of American cheese melted over it... Yum. Thanks for the inspiration! Great! Glad you found something you liked here!